When he called me, I had just arrived at my apartment. It had been an early shift. I was tired. I didn’t really feel like talking to anybody. I usually don’t. The plan was to head to Eagle Rock Brewery. I didn’t have a car and he was going to have to pick me up. I was waiting in my dirty apartment thinking maybe it would’ve been better if I told him that I couldn’t go. That I was sick. I’ll have to cheer him up. I hate saying things like, “You’re not your job” or, “You’re better than that place.” Everybody says those things. We’ve known each other too long to start a conversation like that. He’ll really want to talk. It was grey out. The cement was still damp from the morning’s rain. He pulled up and I got in. He wasn’t looking sad or anything. We didn’t say anything for a time. We were heading through Highland Park. “OK. That’s fine,” I said. He turned off San Fernando Road onto Roswell Street, which was more like a small alley. 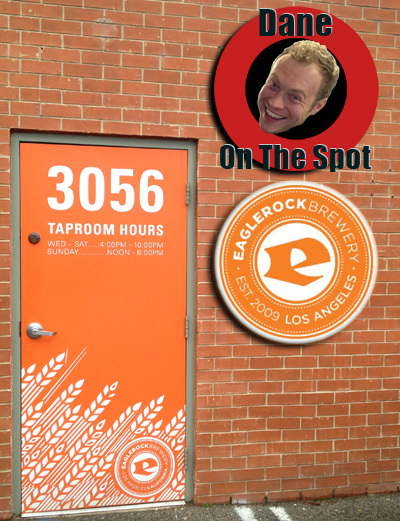 We reached Eagle Rock Brewery. There was no sign. The brewery itself is just a large industrial building on the corner of Roswell and Delay. You could easily drive by it if you didn’t know what you were looking for. “We’re not going to be able to park in the lot,” he said. My friend was already chatting with Andrew, a regular face behind the bar and in the brewhouse. 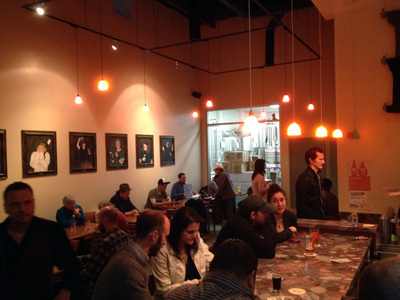 In fact, all the key players have somewhat comical, painted portraits that line the far wall of the taproom. This is really a family run brewery. The door behind the bar, often left open, reveals an office that i’m sure all of the business for this place is done in. It’s a small, well designed brewery. And it’s grown to become a staple of the LA beer scene. 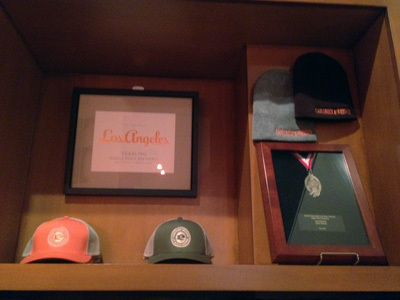 In 2011 Los Angeles magazine named Yearling, their seasonal flanders red ale, as best local brew. They also received a gold medal at the 2010 Great American Beer Festival for their Pro-Am beer Red Velvet. The italian riverbed bar only sits six people, and there are six tables that fill the rest of the space. A single burgundy painted wall and numerous small hanging lights radiate a very relaxed and mellow atmosphere. I stopped eating pretzels and looked at the magnetic signs behind the bar. There were seven house beers and one guest tap. 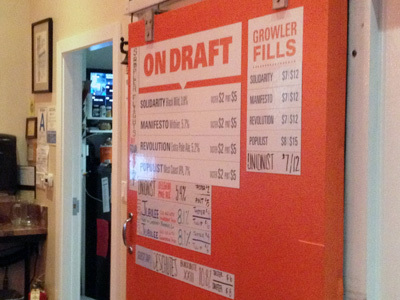 Solidarity, Manifesto, Revolution, and Populist, are all available for $5 a pint. They also have a rotating assortment of seasonal beers that are available, this particular day they had Jubilee, their winter beer. A taster is $2, $4 for seasonal beers, and a discount if you buy a flight. Growlers, both 1 liter and 2 liter, and fills are available with prices differing depending on the beer and quantity, but generally $7 to $12. “I’ll have the Manifesto” I said. He ordered the Solidarity. In retrospect our beer choices were incredibly appropriate. A table was open and we sat down. It was time to talk. I didn’t know what to say. “It’s real nice,” I said. The only other window in the place looks into the brewery itself. 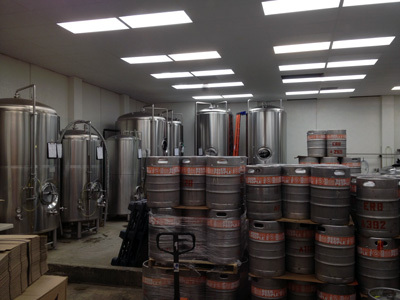 The large stainless steel vessels were shining. There were stacks of kegs and people walking back and forth. You can take a tour on Sundays. 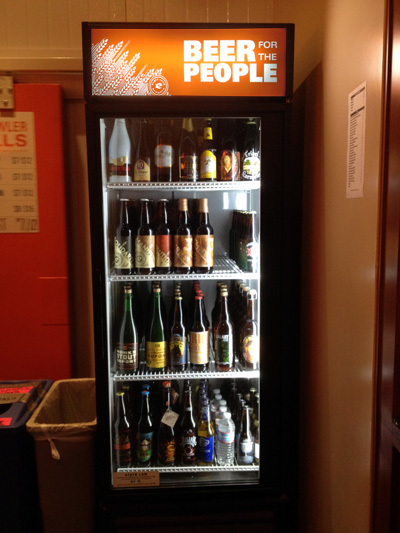 “Beer For The People.” I read again on a label. OK, I thought, I’ll just drink the beer. It was warming. As I sat there taking sips of the witbier, the hum of the people seemed to move through me. I started looking around. There were the two middle-aged women next to me talking about their kids. Past them was an old man visiting from New York. He was joking that his son was buying the beer and not him. The two well dressed guys at the bar seemed to share that awkwardness of being on a first date. Jeremy, one of the owners, was sitting across from us on his laptop typing away at something. The loner by the window was just looking into space, dreaming. There were also the people in the brewery. All of them working away on the next batches, making the stuff that brought us all here. All of us just people doing what we do. And there we were. The two friends that have known each other for a real long time. We finished our beers. A smile came over his face. He was getting real excited about sharing this with me. About being here. So was I. He ordered at the bar and I watched him as he walked over with a flight of four tasters all held together by a piece of wood with holes in it. I took mine. He took his. We each took a sip. It was smooth. Very refreshing. It was Unionist, one of the best Belgian Pale Ales I’ve ever had. He was looking at me. This entry was posted in Dane On The Spot. Bookmark the permalink.